Conference room to conference room: Setting up for a cross-Pacific meeting. Bearing this in mind, it stands to reason that Olympus would be planning a similar treatment with regards to the E-M1 Mark II. Since its surprise reveal at Photokina 2016, and particularly since we’ve published our full review, we’ve emailed back and forth with both feedback and feature requests for Olympus Tokyo to consider in future firmware updates. This all culminated in an international video conference call last week, where we learned a great deal about just what Olympus’ has in store. To see considerations as significant as refinement of the autofocus algorithm this early in a product cycle is encouraging. Olympus is adamant (and, given what we’ve found in our full review, rightfully so) that the E-M1 II is part of a system that can appeal to professional shooters looking for a more compact kit without sacrificing anything in terms of overall speed. Admittedly the smaller Four Thirds sensor lags behind many cheaper APS-C and Full Frame solutions with regards to low light and noise performance, but no other camera offers 18fps Raw burst shooting with continuous autofocus, and the smaller sensor in the E-M1 II is precisely what allows the camera to do so. 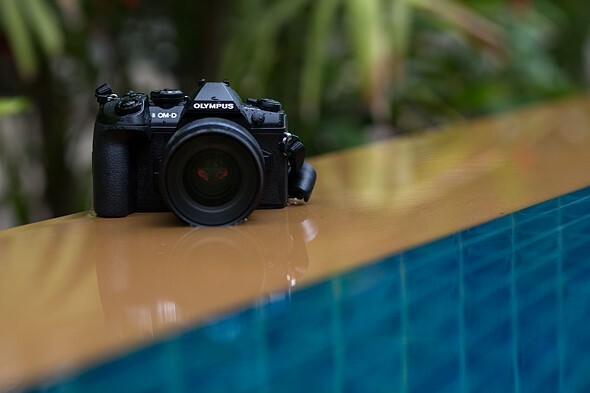 In addition to letting us know what they’re working on for future firmware upgrades, Olympus gave us some further insight into some of the E-M1 II’s headline capabilities. With regard to autofocus during burst shooting, the camera is able to capture and analyze phase-detection autofocus information of the image that has just been captured to use it in tandem with Live View autofocus information for more accurate prediction of subject movement – this is all meant to improve tracking performance. The in-body image stabilization system currently allows around 5.5 stops of image stabilization at 40mm (80mm equiv.) focal length, with shorter focal lengths reducing overall effectiveness, as with shorter focal lengths, you have ever lengthening exposure times where body shake – as opposed to hand shake – becomes dominant (this is true of all IS systems). Smaller amplitude and higher-frequency shaking from hand shake is far easier to engineer for in terms of sensor movement than high amplitude, slow-frequency shake from a photographer’s whole body. There are, of course, reports of users getting sharp shots at shutter speeds ranging from 2-10 seconds, though these users are also bracing against larger body movements by leaning on a wall, or placing elbows on a desk. As with its predecessor, weather sealing and durability was a big point of emphasis on the E-M1 Mark II. That being said, the engineers stated that they are aiming to push image stabilization technology even farther than the 6.5 stops afforded when the E-M1 II is paired with an image stabilized lens, such as the 300mm F4 Pro or 12-100mm F4 Pro. We asked them how they aim to do this, and were greeted with a wry smile or two – certainly indicative of some confidence in their ongoing development. Olympus was also able to tell us that the E-M1 II was ‘benchmarked’ against competitors’ models, with a concerted effort being made to improve upon them. In this vein, particular attention was paid to speed of image playback (which is blazingly fast, and highly important considering the burst speeds), JPEG tonality, noise reduction and overall quality (important for quickly filing photos on, say, breaking news assignments), and run-and-gun movie capability, especially in terms of movie image stabilization. It’s clear that Olympus is proud of the E-M1 Mark II, and is serious about tackling its shortcomings with firmware upgrades wherever possible. One thing they won’t be able to fix with firmware is one of the E-M1 II’s biggest criticisms: the price remains prohibitively high for many. But given what Olympus is already aiming to tackle, those investing in the Olympus system for the long term are likely to be rewarded. It’s become more common practice over the past few years to bring updates to camera models (particularly flagships) throughout the product cycle. It’s encouraging to see Olympus continue this going forward, not only in terms of usability and technical improvements, but perhaps new features as well – we’ll just have to wait and see.